Garam Masala powder is a mixture of different spices ground into powder. It is used a lot in Indian and South Asian cuisines. Everyone have their own version of spices and ratios they use, to make this recipe. It is not a difficult process and it stores pretty well. You can adjust the intensity and flavor of spices to your preference by making it at home. My mom used to mix the whole spices, put them in a tray in one layer and keep them under direct sunlight for few hours before grinding them into powder. However, you can just roast spices lightly on stovetop before grinding them. Below is the version that my sister makes. 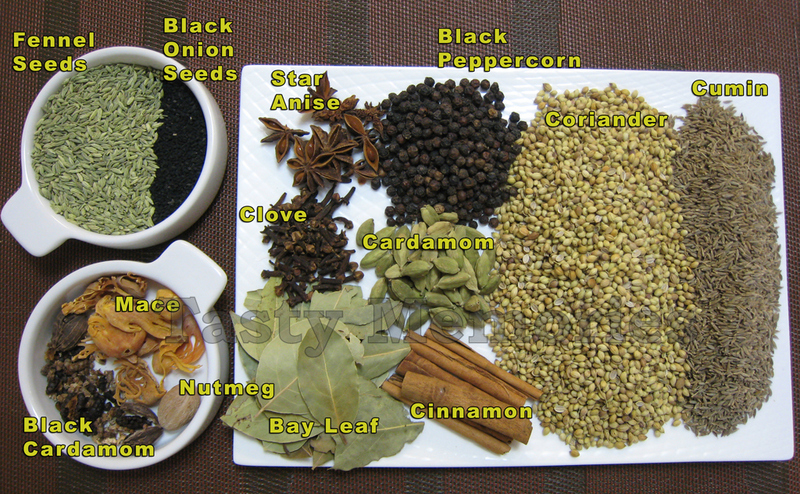 Once you start making your own garam masala at home, I don’t think you’ll ever go back to a store bought version. I’ve listed some of the ingredients as optional in case some of us don’t use spices in daily cooking and don’t want to invest in them. I’ve found that Indian grocery stores have better value on whole spices. Combine all spices except nutmeg in a large skillet. Dry roast on very low heat for about 10 minutes or until fragrant while stirring to make sure that the spices don’t burn. Remove from heat, transfer to a plate and let it cool. Using a spice grinder or coffee grinder, grind them into a fine powder. Sieve through a fine mash and keep the garam masala in an airtight container. This version is little mild but if you prefer a hotter Masala, add more black pepper. Some people also add dried red chilies in their garam masala. If you have powerful grinder, you don’t need to discard the pods of black cardamom, just grind them all together. Hi Ke. Long time no post.